Now this is a great way to kick off the year! I will be performing with Ed Devane, John Daly, Harry Moore and Mick O'Shea at Triskel Christchurch, that hub of artistic activities in downtown Cork. Join us at the entirely civilised time of 2pm, 14 January 2012. Even if you need a coach back out of the city, you will still have time for a pint with us afterwards. People often ask me (as recently as this afternoon) what exactly it is that I do. Sound art, live improvisation, electroacoustic composition... there are many possible descriptions. But I also like the term chosen here, "experimental music" since it does not attempt to define the content of the activity. All you know is that you're getting music, though that should be understood in the most extensive sense of that term -- "organised sound" as Varèse defined it. 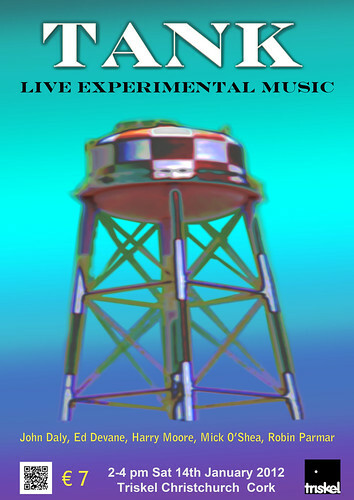 You also know it will be "experimental", a word that simply means the music could fail. That rules out songs, rehearsed structures of any stripe, and idiomatic music like jazz. But it includes everything that extends our relationship with sound and the culture that surrounds sound. For Tank, the five performers will be on stage simultaneously, but not playing together. Rather, we will experiment in turn, one following on from where the last has left off. Or at least that's how it was explained to me! One week from today we shall see. More to the point, we will hear. I am looking forward to it! A big thank-you to Tony Langlois and Harry Moore for organising this event, and asking me to take part.